President Nana Addo Dankwa Akufo-Addo has expressed government’s readiness to re-define and reposition Ghana’s relationship with the European Union (EU) in order to benefit from existing potentials for enhanced development. “We are looking to re-define and re-position our relationship with the EU on a new basis because we think that it’s a healthier basis and it is one that also has a stronger potential for our development,” he said. President Nana Akufo-Addo said this when the EU ambassador to Ghana, Mr William Hanna called on him to bid him farewell at the Jubilee House on Wednesday, March 28, 2018. He said the country had been a beneficiary of different kinds of support across different sectors of national life and that those were investments that the people of Ghana appreciated very much. The President praised the outgoing EU ambassador for the determination that accompanied his efforts to ensure that the development of the country thrived. 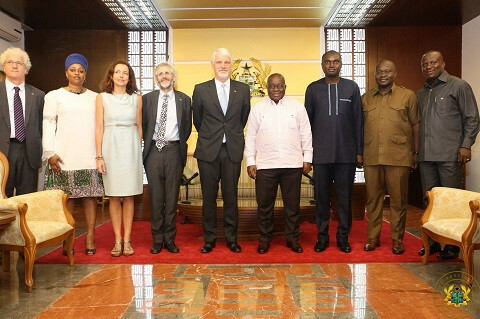 He said Ghana had felt pretty comfortable dealing with the EU due to the astuteness of the ambassador and the contributions the EU had made to the strengthening of Ghana’s democracy from a long history of political turbulence to the current state of stability that the country had been enjoying for the past 24 years. “The understanding, solidarity and contributions from people like you has been an important aspect of that journey and it’s a journey that our people are determined to continue,” the President said. President Akufo-Addo said looking back at the history of the country, the principles of democratic accountability had been handy for the prosperity and progress of the country. “So the commitment that we have is one that is shared not by only the political elite but by the ordinary people of our country. He said after 61 years of independence, there were still deficits in the way the country was being governed especially in the way that the national economy worked. “The challenge of our generation is to find the formula within the context of democratic institutions and how to address those deficits and overcome them. 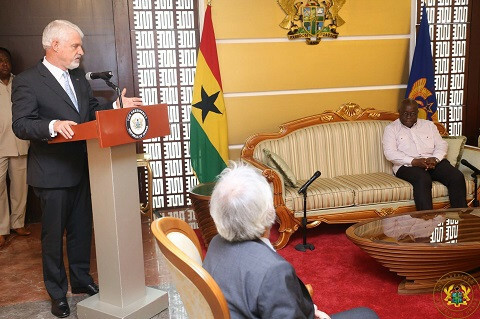 The President said he was encouraged not because of the willingness on the part of the Ghanaian people to succeed but also the friendship, solidarity and co-operation of the EU and persons such as the outgoing ambassador. “The legacy of your work will continue. It is a legacy that has helped us,” he added. The outgoing EU ambassador, Mr Hanna said he came to Ghana in September 2014 and that it was his last posting considering that he had reached the age of retirement. He said what the EU had been doing over the years was to stress that the relationship between Ghana and the EU was a broad one that was not only about aid even though it had ensured that the aid it provided Ghana was more effective and useful and acted as a catalyst for development. 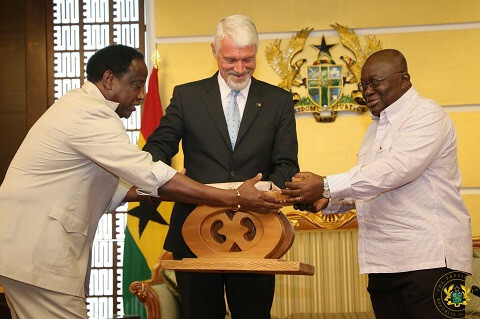 He said he was gratified that during his stay in Ghana, the Economic Partnership Agreement (EPA) between Ghana and the EU had been signed and expressed regret that it had not taken place at the regional level since the idea was to get that agreement effected between the EU and the countries in the entire West Africa. Mr Hanna said more investors were coming and prepared to invest in Ghana because of the level of confidence that the EU had in Ghana. He said the smooth conduct of the 2016 elections which was adjudged by all as free, fair and transparent was a defining moment for the country. “It was Ghana again showing to the rest of the world, an example of democracy and one which we hope to see in other parts of Africa,” he said. He said the EU fully supported the deepening of democracy at the local level through the election of Metropolitan, Municipal and District Chief Executives (MMDCEs), as well as the creation of the office of the special prosecutor, which were bold initiatives of the Nana Akufo-Addo administration.